We’ve all retweeted someone or favorited a tweet right? While on the twitter website, if you hover over a tweet, you’ll see the options Reply, Retweet and Favorite. Have you ever noticed the 3 little dots followed by the word “More”? If you click on “More”, you’ll get two options Email Tweet and Embed Tweet (figure 1). Clicking on “Embed Tweet” will launch a dialog box with the HTML embed code and a prieview of what the embedded tweet will look like (figure 2). 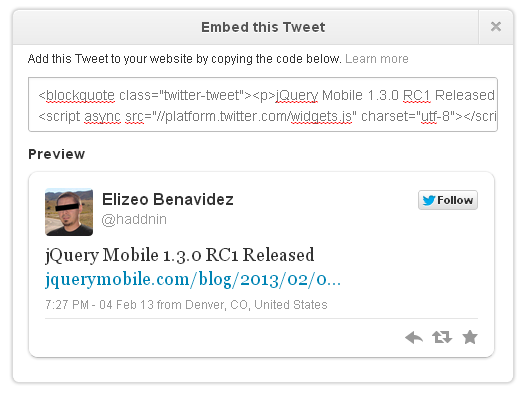 Simply copy the code and paste it into your blog or web page where you would like to see the embedded tweet. Below are a couple of options for controlling how the embedded tweet will display. You can find a full list of options here.